aleph bees introduction from tehn on Vimeo. It’s like having a roomful of modulars inside a mysterious magic box. It’s like using Max/MSP with the control interface of an Etch-a-Sketch. It’s … okay, really hard to describe. But aleph bees is certainly unlike digital hardware we’ve seen before. 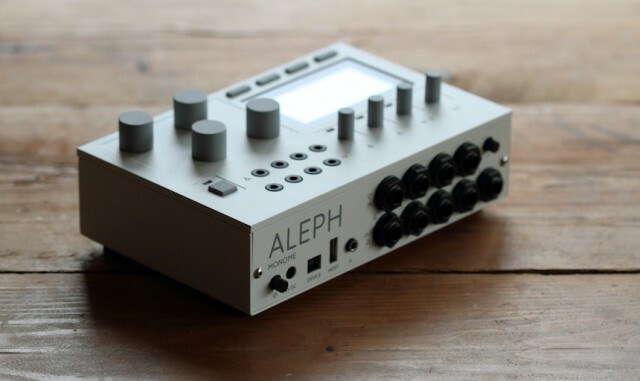 Using just knobs and text, and silky-smooth sound features – everything runs fast and glitch-free, even hot-swapping hardware – aleph bees is a kind of experiment in computer minimalism. It’s as open-ended as a computer, but in ruggedly-simple hardware. It lets you program custom software with a few twists of your wrist and some button presses. It’s hard not to be oddly inspired by it, even if you decide you don’t want one. (At US$1400, it isn’t quite an impulse buy.) And iff this seems like something that would appeal to a very niche crowd, you’re right. So far, only a handful of aleph units are in the world. we’ve made great advances with the software over a short time and are enthusiastic to reach a bigger audience for more participation. we have a few great audio programmers jumping in and i’m looking forward to seeing what they do with this system. Brian admits that aleph is ambitious and hard to explain, and welcomes questions. So ask away, whether you think this is the bee’s knees or you’ve just got a bee in your bonnet. aleph wurl snow from tehn on Vimeo.